Saint Peter's tomb is a site under St. Peter's Basilica that includes several graves and a structure said by Vatican authorities to have been built to memorialize the location of St. Peter's grave. St. Peter's tomb is near the west end of a complex of mausoleums that date between about AD 130 and AD 300. The complex was partially torn down and filled with earth to provide a foundation for the building of the first St. Peter's Basilica during the reign of Constantine I in about AD 330. Though many bones have been found at the site of the 2nd-century shrine, as the result of two campaigns of archaeological excavation, Pope Pius XII stated in December 1950 that none could be confirmed to be Saint Peter's with absolute certainty. However, following the discovery of further bones and an inscription, on June 26, 1968 Pope Paul VI announced that the relics of St. Peter had been identified. 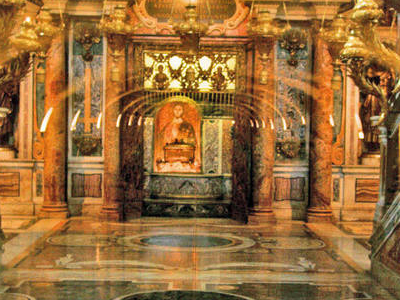 The grave claimed by the Church to be that of St. Peter lies at the foot of the aedicula beneath the floor. The remains of four individuals and several farm animals were found in this grave. In 1953, after the initial archeological efforts had been completed, another set of bones were found that were said to have been removed without the archeologists' knowledge from a niche (loculus) in the north side of a wall (the graffiti wall) that abuts the red wall on the right of the aedicula. Subsequent testing indicated that these were the bones of a 60-70 year old man. Margherita Guarducci argued that these were the remains of St. Peter and that they had been moved into a niche in the graffiti wall from the grave under the aedicula "at the time of Constantine, after the peace of the church" (313). Antonio Ferrua, the archaeologist who headed the excavation that uncovered what is known as the St. Peter's Tomb, said that he wasn't convinced that the bones that were found were those of St. Peter. Here's the our members favorite photos of "Tombs in Vatican City". 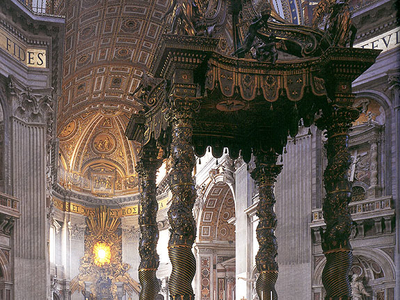 Upload your photo of Saint Peter's Tomb! Margot Wilson is the only Touristlink member to visit Saint Peter's Tomb. Have you been here? Click here to save it.